This is the longest of our holidays from St Ives to Penzance. Walking the whole route over 5 days gives you enough time to enjoy the route but still provide a significant challenge and a sense of achievement (or relief) at the end! 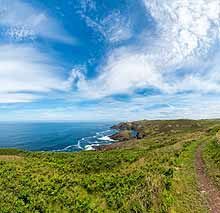 With the 5 day walking itinerary set out below, one of the hardest but shortest sections is on day one between St Ives and Zennor. Meaning that you get the slightly more tougher climbs completed on day one of walking to allow you to enjoy the route as it winds down across the coastline to Penzance. After spending your first night in St Ives, take some time to explore before you begin your 6 miles to Zennor. These first few miles can be quite tough, but you are rewarded with stunning views. As you come away from the hustle and bustle of St Ives you begin to feel the calmness of the coastline. The path now follows the coastline, sending you on endless ups and downs as it travels through fields and across rocky terrain. You will need to remember to keep an eye on your footing as some sections need to be taken with care. While the dramatic landscape is reward enough, after walking this section you will also notice the evidence of its ancient occupation. The next 7 miles of the trail are rocky and occasionally challenging. The path cuts across the side of Gurnard’s Head and winds across the boulder-strewn cliffs of Bosigran, a favourite spot for rock climbers. From here you mainly follow the coastline with a few ascents and descents over the coves. Once you reach the lighthouse at Pendeen Watch you’ll follow a tarmac road leading to the facilities at Pendeen village. There are a lot of interesting local sights to see from Pendeen to Sennen Cove. For example you will notice the scattered tin-mine ruins and beautiful views over cliff tops. When leaving Pendeen you come across the Geevor Tin Mine which is now a museum with lots of interesting facts about the history of the local area. The path then passes right behind the remains of the Levant mine and onto the eyrie cliff top location of Crown Mine near Botallack. Before you reach Sennen Cove you are rewarded with marvellous views over Whitesand Bay. Keep an eye open for gannets, fulmars, kittiwakes, shags, razorbills and even the cornish chough, once extinct in the county but now making a welcome return. On leaving Sennen Cove the route begins with a short but steep climb out of the village onto the trail. You will follow the cliff tops towards the Mayon Old Coastguard lookout. After a gentle walk along the cliffs you reach the most south-westerly point in the UK, Lands End. Don’t forget to take a picture at the famous Lands End signpost. After leaving Lands End you have an easy stroll over the cliffs but bear in mind that in bad weather this section can become challenging as it is exposed with restricted areas to shelter. In good weather you are treated to outstanding views towards the dramatic arched rock of Enys Dodnan Arch. The path then continues on along the coastline passing over the top of Nanjizal beach. Following the coastal path the trail ends at the iconic Minack Theatre – an open-air theatre carved into the granite cliff and not to be missed. Upon leaving the coastal village of Porthcurno you pass over the top of some truly magnificent sandy beaches. After passing Porthcurno beach and Pedn Vounder Beach you come across the famous point of Logan Rock – a 70 tonne boulder that could once be rocked by pushing it gently. From Logan Rock you walk onwards to Cribba Head from where you descend onto Penberth, which is a delightful little fishing village. Round the corner from Penberth is Porthguarnan Cove where the path drops a couple of hundred feet to the bottom of the cove. You then climb straight out again for the steepest section on the trail. From there you follow the trail through a mixture of landscapes, from woodland sections to flat cliff tops with a few ups and downs in and out of different coves. You pass through Lamorna Cove and then keep following the trail towards Mousehole (pronounced as Mauzole). From here the trail is along a tarmac road through the village of Newlyn. After a short while following the trail you reach your finishing point of Penzance. By Air: The closest airport to St Ives is Newquay Airport which is about a 50 minute drive from St Ives. Newquay Airport is mainly used for domestic flights. If travelling from overseas the main airport to fly to is London Heathrow. From London Heathrow you can travel by train from Paddington Station to St Ives via St Erth train station. By Road: We would advise to use public transport where possible on all of our South West Coastal path holidays. As car parking can be very difficult in most areas and is usually an expensive option. The easiest way to drive to Cornwall is to join the M5 to Exeter and then take the A30 via Bodmin all the way to St Ives. From Exeter it takes about two hours when driving to St Ives. By Road: From Penzance you can take the A30 via Bodmin and then the M5 to Bristol. Then you take the M4 straight through to the M25 into London. The journey can take at least 6 hours without traffic.